The control of ventilation refers to the physiological mechanisms involved in the control of breathing, which is the movement of air into and out of the lungs. Ventilation facilitates respiration. Respiration refers to the utilization of oxygen and removal of carbon dioxide by the body as a whole, or by individual cells in cellular respiration. The most important function of breathing is the supplying of oxygen to the body and the removal of its waste product of carbon dioxide. Under most conditions, the partial pressure of carbon dioxide (PCO2), or concentration of carbon dioxide, controls the respiratory rate. The peripheral chemoreceptors that detect changes in the levels of oxygen and carbon dioxide are located in the arterial aortic bodies and the carotid bodies. Central chemoreceptors are primarily sensitive to changes in the pH in the blood, (resulting from changes in the levels of carbon dioxide) and they are located on the medulla oblongata near to the medullar respiratory groups of the respiratory center. Information from the peripheral chemoreceptors is conveyed along nerves to the respiratory groups of the respiratory center. There are four respiratory groups, two in the medulla and two in the pons. The two groups in the pons are known as the pontine respiratory group. From the respiratory center, the muscles of respiration, in particular the diaphragm, are activated to cause air to move in and out of the lungs. Breathing is normally an unconscious, involuntary, automatic process. The pattern of motor stimuli during breathing can be divided into an inhalation stage and an exhalation stage. Inhalation shows a sudden, ramped increase in motor discharge to the respiratory muscles (and the pharyngeal constrictor muscles). Before the end of inhalation, there is a decline in, and end of motor discharge. Exhalation is usually silent, except at high respiratory rates. The respiratory centre in the medulla and pons of the brainstem controls the rate and depth of respiration through various inputs. These include signals from the peripheral chemoreceptors and central chemoreceptors; from the vagus nerve and glossopharyngeal nerve carrying input from the pulmonary stretch receptors, and other mechanoreceptors in the lungs. as well as signals from the cerebral cortex and hypothalamus. ventral respiratory group (includes the nucleus ambiguus, and the pre-Bötzinger complex). The ventral respiratory group controls voluntary forced exhalation and acts to increase the force of inhalation. Regulates rhythm of inhalation and exhalation. dorsal respiratory group (solitary nucleus). The dorsal respiratory group controls mostly movements of inhalation and their timing. Involved in fine tuning of respiration rate. Coordinates speed of inhalation and exhalation. Ventilation is normally unconscious and automatic, but can be overridden by conscious alternative patterns. Thus the emotions can cause yawning, laughing, sighing (etc. ), social communication causes speech, song and whistling, while entirely voluntary overrides are used to blow out candles, and breath holding (to swim, for instance, underwater). Hyperventilation may be entirely voluntary or in response to emotional agitation or anxiety, when it can cause the distressing hyperventilation syndrome. The voluntary control can also influence other functions such as the heart rate as in yoga practices and meditation. The ventilatory pattern is also temporarily modified by complex reflexes such as sneezing, straining, burping, coughing and vomiting. Ventilatory rate (respiratory minute volume) is tightly controlled and determined primarily by blood levels of carbon dioxide as determined by metabolic rate. Blood levels of oxygen become important in hypoxia. These levels are sensed by central chemoreceptors on the surface of the medulla oblongata for increased pH (indirectly from the increase in CSF of carbon dioxide), and the peripheral chemoreceptors in the arterial blood for oxygen and carbon dioxide. Afferent neurons from the peripheral chemoreceptors are via the glossopharyngeal nerve (CN IX) and the vagus nerve (CN X). Levels of CO2 rise in the blood when the metabolic use of O2, and the production of CO2 is increased during, for example, exercise. The CO2 in the blood is transported largely as bicarbonate (HCO3−) ions, by conversion first to carbonic acid (H2CO3), by the enzyme carbonic anhydrase, and then by disassociation of this acid to H+ and HCO3−. Build-up of CO2 therefore causes an equivalent build-up of the disassociated hydrogen ions, which, by definition, decreases the pH of the blood. The pH sensors on the brain stem immediately sense to this fall in pH, causing the respiratory center to increase the rate and depth of breathing. The consequence is that the partial pressure of CO2 (PCO2) does not change from rest going into exercise. During very short-term bouts of intense exercise the release of lactic acid into the blood by the exercising muscles causes a fall in the blood plasma pH, independently of the rise in the PCO2, and this will stimulate pulmonary ventilation sufficiently to keep the blood pH constant at the expense of a lowered PCO2. Mechanical stimulation of the lungs can trigger certain reflexes as discovered in animal studies. In humans, these seem to be more important in neonates and ventilated patients, but of little relevance in health. The tone of respiratory muscle is believed to be modulated by muscle spindles via a reflex arc involving the spinal cord. Drugs can greatly influence the rate of respiration. Opioids and anesthetics tend to depress ventilation, by decreasing the normal response to raised carbon dioxide levels in the arterial blood. Stimulants such as amphetamines can cause hyperventilation. Pregnancy tends to increase ventilation (lowering plasma carbon dioxide tension below normal values). This is due to increased progesterone levels and results in enhanced gas exchange in the placenta. Receptors play important roles in the regulation of respiration and include the central and peripheral chemoreceptors, and pulmonary stretch receptors, a type of mechanoreceptor. Central chemoreceptors of the central nervous system, located on the ventrolateral medullary surface, are sensitive to the pH of their environment. Peripheral chemoreceptors act most importantly to detect variation of the PO2 in the arterial blood, in addition to detecting arterial PCO2 and pH. The Hering-Breuer reflex that terminates inhalation to prevent over inflation of the lungs, and the reflex responses of coughing, airway constriction, and hyperventilation. The upper airway receptors are responsible for reflex responses such as, sneezing, coughing, closure of glottis, and hiccups. The spinal cord reflex responses include the activation of additional respiratory muscles as compensation, gasping response, hypoventilation, and an increase in breathing frequency and volume. The nasopulmonary and nasothoracic reflexes regulate the mechanism of breathing through deepening the inhale. 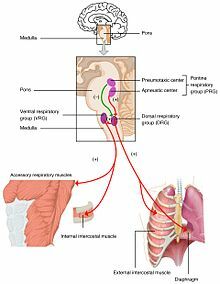 Triggered by the flow of the air, the pressure of the air in the nose, and the quality of the air, impulses from the nasal mucosa are transmitted by the trigeminal nerve to the respiratory center in the brainstem, and the generated response is transmitted to the bronchi, the intercostal muscles and the diaphragm. ^ Barrett, Kim E.; Barman, Susan M.; Boitano, Scott; Brooks, Heddwen L. (2012). Ganong's review of medical physiology (24th ed.). New York: McGraw-Hill Medical. ISBN 0071780033. ^ a b Tortora, Gerard (2008). Principles of anatomy and physiology (12. ed.). Hoboken, N.J.: Wiley. pp. 905–909. ISBN 978-0470-23347-4. ^ a b c Pocock, Gillian; Richards, Christopher D. (2006). Human physiology : the basis of medicine (3rd ed.). Oxford: Oxford University Press. pp. 332–336. ISBN 978-0-19-856878-0. ^ Kuna, Samuel T (2000). "Respiratory-related activation and mechanical effects of the pharyngeal constrictor muscles". Respiration Physiology. 119 (2–3): 155–161. doi:10.1016/S0034-5687(99)00110-3. ISSN 0034-5687. ^ Hall, John (2011). Guyton and Hall textbook of medical physiology (12th ed.). Philadelphia, Pa.: Saunders/Elsevier. pp. 505–510. ISBN 978-1-4160-4574-8. ^ Prasad, K.N. Udupa ; edited by R.C. (1985). Stress and its management by yoga (2nd rev. and enl. ed.). Delhi: Motilal Banarsidass. pp. 26 ff. ISBN 978-8120800007. Retrieved 17 July 2014. ^ Coates EL, Li A, Nattie EE. Widespread sites of brain stem ventilatory chemoreceptors. J Appl Physiol. 75(1):5–14, 1984. ^ Cordovez JM, Clausen C, Moore LC, Solomon, IC. A mathematical model of pH(i) regulation in central CO2 chemoreception. Adv Exp Med Biol. 605:306–311, 2008. Paul, Anthony D.; et al. (1995). "Neuronal Connections of a Ventral Brainstem Respiratory Chemosensitive Area". In C. Ovid Trouth. Ventral brainstem mechanisms and control of respiration and blood pressure. New York: M. Dekker. pp. 517–523. ISBN 0-8247-9514-8. OCLC 32169247.